BHP Billiton Ltd's have learnt nothing from this disaster, on the contrary they are seeking additional oceans, environments and communities to destroy. BHP petroleum division is seeking potential acquisitions as part of its expansion plans, president Michael Yeager says. 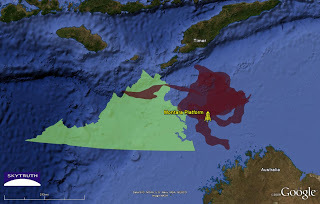 Mr Yeager also said the Woodside Petroleum Ltd-led Browse liquefied natural gas (LNG) project in Western Australia's Kimberley region would be technically challenging. "There are a number of major technological issues on the Browse development that will be difficult to handle," he said. "Certainly, when it comes to the pipeline ashore, we'll be talking about a diameter and a distance that is very difficult and for the most part, beyond what the industry has done fully. "The seafloor in this part of the ocean is a little softer, so our options for anchored floating vessels will be a bit more challenging. "We think these things are all solvable, but clearly they add complexity, they add capital risk to the project." While the project's joint venture partners in February ratified Woodside's selection of James Price Point near Broome for an LNG processing hub, Mr Yeager indicated that BHP Billiton would have preferred to have spent more time examining other options. The other option was to pipe gas to Woodside's existing LNG processing facilities at Karratha. "When you look at landing the gas onshore, our preferred option is to look at both concepts equally for as long as possible.